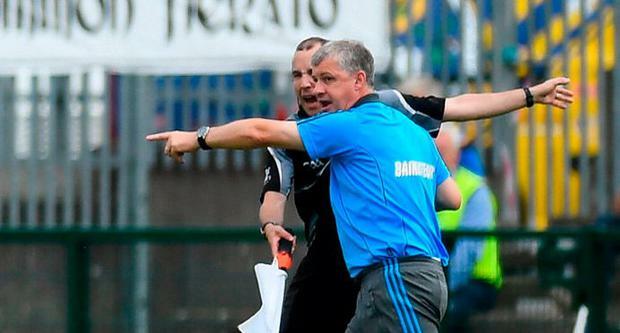 Kevin McStay has accused some GAA referees and officials of lacking courtesy after Roscommon's defeat to Donegal at Dr Hyde Park yesterday. The Rossies boss is facing the prospect of a minimum 12-week ban for putting his hands on linesman Niall Cullen after a decision went against his side just before half time in their 0-20 to 0-13 loss. Speaking to Off The Ball after the game, McStay took aim at the standard of officiating in the GAA and the attitude taken by certain officials. On the incident that sparked his ire, he said: "If he didn't see it, he was the only one in the stadium who didn't see it. It was a completely obvious call. "Ciaran Brannagan didn't see it, I imagine, because he was the wrong side of it, but the linesman was facing it. "I come across a lot of this stuff. Some of these linesmen are incredibly precious and they like to play the hard man. It's not very pleasant when you're trying to manage a team. All you are looking for is a bit of civility and decency but they just dismiss you like you have nothing to do with the bloody occasion. "I put a lot of time in. I could more agitated than I should have but we're all trying but a little bit of courtesy from officials... most of them find it very easy to be courteous and help out in any way they can within the rules but others are less than generous with their time. "I apologised to the referee at half time. Apparently the ball struck him in the head but that was absolutely an accident. I was throwing the ball back to where I thought the free had been and then I realised he had called half time. I would never do that purposely. "By that stage he had said that I had been aggressive to him and he was complaining to the referee about it and I suppose the referee had no option but to take some action. "It the one thing this association just can't seem to get right and that's officiating. Good officiating where all the officials are tuned in to what is going on around the place. There is a lot that goes on on football fields nowadays that isn't being reffed at all, it's left to the players to sort out."